The Canon EF 15mm f/2.8 Fisheye Lens is currently one of Canon's two intentionally distorted EF lenses. The heavy barrel distortion from the 15 Fisheye creates a special effect that is liked by most people (until it is over-used of course). With digital capture, we can now use fisheye-to-rectilinear conversion software to create a corrected picture equivalent to what a 12-13mm rectilinear lens would yield. This is great - but it takes some extra post-processing work and requires some knowledge of what the end-result will look like when capturing the shot. PTLens is a really easy to use (Low $) rectilinear conversion software program (or Photoshop Plugin) based on Panorama Tools (included and free). Photoshop's lens correction tools can also rectilinear-convert the fisheye distortion. The downside to rectilinear conversion is that the image corners become soft. Reducing the image to 70% or less allows much of the corner sharpness to be recovered at the expense of the pixel size of the image. Build quality of the Canon EF 15mm f/2.8 Fisheye Lens is reasonable. The metal mount shows it is not a bottom of the line lens. The focus ring feels relatively low quality, but this lens does not cost a fortune either. Pictured above from left to right are the Canon EF 15mm f/2.8 Fisheye Lens, Canon EF 14mm f/2.8L USM Lens, Canon EF 14mm f/2.8L II USM Lens, Canon EF 16-35mm f/2.8L II USM Lens and Canon EF-S 10-22mm f/3.5-4.5 USM Lens. Below are the same lenses (sans the 14mm L I) with their lenses hoods in place. The size of the 15 Fisheye is very small - and very nice. It is much smaller than the Canon EF 14mm L USM Lens, Canon EF 16-35mm L USM Lens or Canon EF 17-40mm L USM Lens. The 15 Fisheye focuses moderately slowly and makes a loud buzzing doing so. Reality is that fast focusing is not very important to most people using this lens. A lens this wide does not need to adjust much to go from close to infinity. FTM (Full Time Manual) focus is not available. The manual focus ring is coarse - not smooth. Along the same lines, the Canon EF 15mm f/2.8 Fisheye Lens only has 5 aperture blades. This creates undesirable 5-pointed out-of-focus highlights. But, this lens is so wide that it is hard to get the background out of focus. So, this negative point is probably not important to most people either. When I think of a highly distorted lens, I would expect the most distorted areas of the picture to be of lower quality. But that is not the case with the15 Fisheye. This lens has very nice image quality. Close subjects tend to be soft at f/2.8 and become steadily sharper through f/8. Distant subjects were sharp wide open and improved little with the lens stopped down. What was most noticeable to me was the relatively excellent corner sharpness even on a full-frame body. The Canon EF 15mm f/2.8 Fisheye Lens easily bests the Canon EF 14mm L USM Lens, the Canon EF 16-35mm L USM Lens and the Canon EF 17-40mm L USM Lens for corner sharpness. At least until it is converted to rectilinear. Vignetting is apparent at f/2.8, but less apparent than most of the alternatives. Vignetting disappeared quickly as the lens was stopped down. Flare is moderately well controlled on the Canon EF 15mm f/2.8 Fisheye Lens. For flare, it was much better than the Canon EF 14mm L USM Lens but not as good as the Canon EF 16-35mm L USM Lens. In harsh/heavy contrast conditions (such as dark tree branches against a bright cloudy sky), CA (Chromatic Aberration) is a problem. It was generally not a problem in my real life shots, but very present under certain conditions. Like the Canon EF 14mm f/2.8L II USM Lens, the Canon EF 15mm f/2.8 Fisheye Lens features a convex objective lens (yes - both the objective lens and the pictures it takes look like fish eyes) and a fixed metal petal type lens hood. Gelatin filters inserted into the rear of the lens are the only filters that can be used on this lens. Standard screw-in protective UV filters can not be used on this lens. Nor can any other screw-in filters for that matter. A special lens cap is required to protect this lens and hood. Canon supplies a nicely manufactured metal cap that slips on over the hood. A fuzzy material on the inner sides of the cap protects the sides of the hood from scratching and gives it some adhesion to the lens. Unfortunately, it falls off far too easily. Canon has solved this problem on the 14mm L II. Color and saturation both are fine. The 15 Fisheye includes more in the picture than the other two f/2.8 ultra wide angle lenses Canon currently makes - the Canon EF 14mm f/2.8L II USM Lens and the Canon 16-35mm f/2.8L USM Lens. These images were taken with a 1.3x FOVCF DSLR body. Here is a full frame (Canon EOS-1Ds Mark III) focal length comparison. The Canon EF 15mm f/2.8 Fisheye Lens' angle of view is so wide that getting adequate flash coverage can be a problem. Expect to minimally need a flash with a built-in flip-down diffuser to cover the frame on a 1.3x or 1.6x FOVCF body. A Sto-Fen Omni-Bounce Diffuser will yield complete flash coverage on all bodies. Bouncing the flash may provide adequate coverage as well. 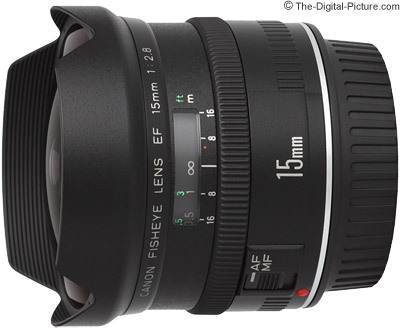 What is the Canon EF 15mm f/2.8 Fisheye Lens used for? Nearly anything that requires an ultra wide angle lens. Similar to the rectilinear ultra wide angle lenses, the 15 Fisheye is useful for wide landscapes, wide day or night sky shots and Interior pictures of houses, vehicles and other confined spaces. The fish-eye look is appealing as a special effect as well. It invites creativity. With an 8" minimum focusing distance, the 15 Fisheye can create some wild-looking effects. Remember to keep your feet out of the picture. 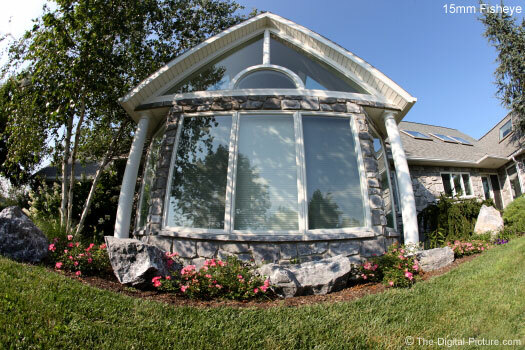 Architecture and real estate photography often have large subjects and require wide angle lenses - these are more good uses for the 15 Fisheye if distortion is acceptable - or removed. I am impressed with the image quality from a lens this wide. If you don't mind the severe distortion or are willing to post-process the distortion out, the Canon EF 15mm f/2.8 Fisheye Lens will make a very nice wide angle lens for you.